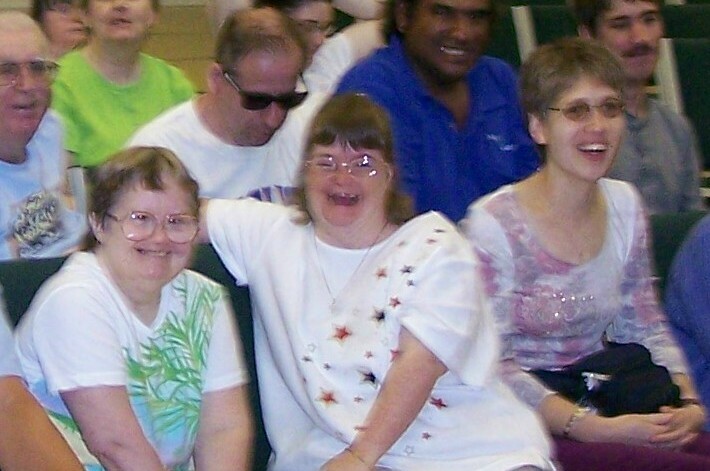 At Special Gathering, which is a ministry within the intellectually disabled community, we take our members on an annual retreat called Retreat Agape. It is located in Vero Beach at Life for Youth Camp. It is a youth summer camp but we rent the entire facility for Memorial Day weekend each year. In every experience in life there are good things and bad things that happen to us. Hopefully, the good will out weigh the bad. Yet, I’ve learned that most important element in this equation is our attitude. Like a light shining in the darkness, a good attitude will break the back of a bad attitude everytime, thereby turning even the most awful experiences into joy. I came from a large family with many in-laws and out-laws. Funerals were part of my childhood memories. I remember massive numbers of aunts, uncles and cousins serving our plates from the feast spread over the large dinner table, with desserts spilling into the living room. The aunts, uncles and cousins balanced their plates and iced tea while roaming outside into the front yard. We sat under the trees, sharing a meal, family gossip and lots of laughter. Always, there was laughter. Even out tears were sprinkled with laughter. As a child, those times were a lot like having a red bug come to dwell in your skin. I hated and loved the tickle. The itch was horrible but scratching the itch was wonderful. There is no doubt that death is our enemy. The legacy of The Garden haunts every moment of our earthly existence. But the Holy Spirit miraculously works the wonder of scratching the itch, turning that which should be horrible into a wonderfully mysterious experience. A friend shares that on a recent vacation she met a couple who were as different as soup and walnuts. The husband was having a marvelous time experiencing all the delights on the resort island where they were staying. Yet the wife was miserable. Nothing had gone right for her. The food was too rich. The A/C was too cold. The ocean was too salty, leaving her sticky. The pool was too warm. Their room was too elegant and sterile, making her uncomfortable. Each day and sometime moment by moment, we decide how our life will be lived. Jesus said, “Blessed (or happy) are the peace maker.” I’m sure that he had also learned to enjoy scratching the itch. What are some of the ways you have learned to scratch the itch. Okay! I admit it. I didn’t think that the current doomsday upheaval deserved any more attention than it was already getting over the airwaves. The Scriptures are pretty clear that we won’t know when the Lord will return. Therefore, May 21 at 6pm was not my biggest concern one week after my husband died and two weeks before Special Gathering ministry takes 200 special needs people to Vero Beach for a four day retreat. However, it was a concern for many of our members who are intellectually disabled but who watch and understand TV news. As I stood in front of our Melbourne program on Sunday morning, I laughingly said, “Well, guess you know we are all still here and the rapture didn’t happen.” When I noticed that most of our members weren’t smiling, I asked, “How many of you were concerned?” Most of their hands went up in the air. Because few of our teachers and chapel leaders were concerned or knew about the coming news hype regarding this issue, it had not been addressed last week at our weekly chapel services. However, as the week had waned and Saturday approached, I became increasingly interested in the reaction of many people I know who are not Christians and who knew that I am committed to Christ. ”What do you think?” I was asked several times. While I knew this was a big hoax, I also know that this is the thing that we, as Christians, have been living to happen. Christ’s return will be a great and glorious day for us. We have no need to fear or be concerned regarding his return. Given the choice of eternal paradise and living here with the hurt, fears and concerns of life, is there really a choice. Central Theme: Jesus will return to earth and take us home. I. Tell the story of Jacob and Esau and how they came to love each other as found in Genesis. A. These two men were very different. B. They set aside their differences and chose to love each other. C. Our family is more than our physical family. II. As Christians we have many people who are our brothers and sisters. A. You will not get along with everyone in your Christian family. B. There is not problem with that unless we become bitter and hateful. C. We should show every person love and not show them spite or criticism. III. Each of us have people that are our family and affection is a part of our relationship with them. B. Affection means touching in love. C. We all need affection and touching in our lives–and we need to give it to others. Conclusion God wants us to relate to our family and our Christian family with love. You cannot imagine how much my family and I appreciate the many cards and memories that you have shared with us, regarding my husband and their father. We especially appreciate the love shown to us from the special needs community. Thank you so much. Rob Kerby, Senior Editor at BeliefNet, a faith-centered Internet site with 20 million subscribers, wrote a lovely tribute to my husband, Frank Howard. To view it, click on his name. In order to help keep you more informed, we are hosting monthly calls to update you on various disability issues as well as to introduce you to persons who work on disability issues in the Federal government. Our next call will be Thursday, May 26 at 3:00 PM Eastern. I would encourage you to call in about five minutes early due to the large volume of callers. If you received this email as a forward but would like to be added to the White House Disability Group email distribution list, please visit our website at http://www.whitehouse.gov/disability-issues-contact and fill out the contact us form in the disabilities section. The call also will include updates on civil rights, health care, and fiscal/budget issues. We strongly urge and ask that you distribute this email broadly to your networks and listservs so that everyone has an opportunity to learn of this valuable information. The conference call information is below. This call is off the record and not for press purposes. For live captioning, at the start time of the event, please login by clicking on the link below. Please only use this feature if you are deaf or hard of hearing. We went to the beach early so the children could play a bit before the final launch of the space shuttle Endeavour. It was Monday morning. The launch was scheduled for 9:23AM. On Tuesday the week before, Frank, my husband of 49 years had died. Because of his commitment to Christ, we knew he was running through heaven. The week had been a blur of tears and laughter. Family and friends came by the house to drop off food or cards. They all lingered for a moment making sure that I was all right. Bitter-sweet times washed through our home like a reoccurring flood of healing balm. Our children, three grandchildren and I had spent much of Saturday sorting and dividing things that the grandchildren wanted to have as a remembrance of their Grandpa. He and I had often talked about what each child would want to have. My husband was a NASA scientist who worked for 45 years on the space program. A good friend of Frank’s had called to accept our invitation to speak at his memorial service. His colleague said, “Frank was a true engineer. He always came with concrete numbers and mathematical proof for his conclusions. There was no guessing or using his instinct when designing systems that related to the space program.” Therefore, this final launch of the Endeavour held more significance for our family than for some of the people dotting the beach. As we watched the silent speck rise effortlessly into space, my eight-year-old granddaughter said in a loud voice, “Goodbye, Grandpa.” Then she repeated it again and again as tears traced my cheeks. I quietly wept for the loss of the man and engineer that I love.